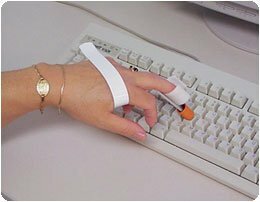 (SEE AVAILABILITY ABOVE FOR ESTIMATED DELIVERY) - Typing Aid - Typing Aid - Hand clip is attached to a soft plastic key depressor. Useful for keyboards, calculators, telephones, etc. Clip may be re - bent to suit individual"s hand. - Rolyan products are internationally licensed & manufactured for home & clinical use. Most of their products offer a lifetime warranty.